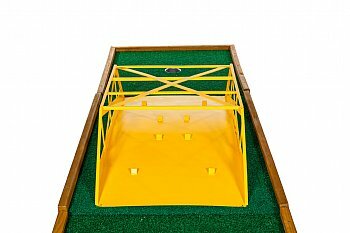 The Steel Bridge mini golf obstacle is included as part of our 9 hole putt putt miniature golf rental. 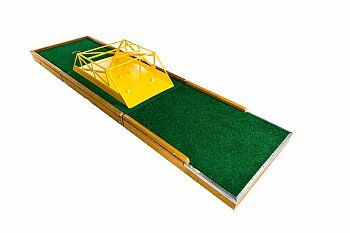 The Steel Bridge mini golf obstacle measures 48 inches long, 24 inches wide and 12 inches tall. 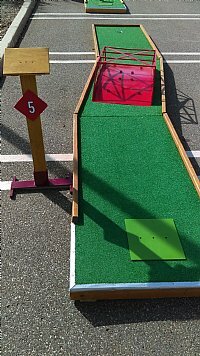 Our putt putt miniature golf rental course designers normally place the Steel Bridge where a firm putt is required and will get you through without any issues. However, due to the length of the Steel Bridge and the bumps on it, there are some crazy bounces that can occur. 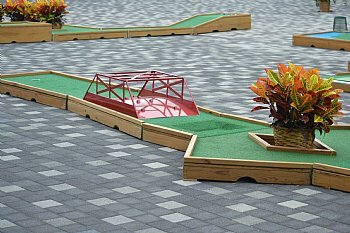 Depending on the putt putt miniature golf rental design, there may be instances where players will have the option of putting around the Steel Bridge. However, that decision is strictly up to our putt putt miniature course designers and they are known not be swayed in their decision making. As with our Ant Hill, Loop de Loop and The Slide mini golf obstacles, the Steel Bridge mini golf obstacle is made to be either outside or inside on our putt miniature golf rentals. 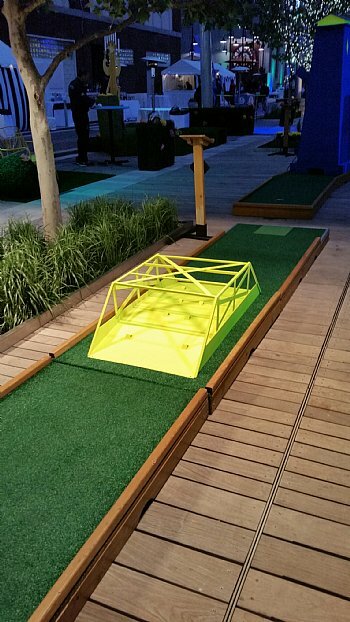 Depending on the color theme of your putt putt miniature golf rental, we can customize the Steel Bridge as well as our other mini golf obstacles to that color theme. The standard color for the Steel Bridge is yellow. 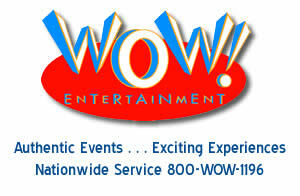 But as pictured, we have made it red as well as black light yellow for corporate events.